Step out of New Delhi to go to Gurugram (Gurgaon) and see Cyber Hub, which is approximately 36 minutes away. 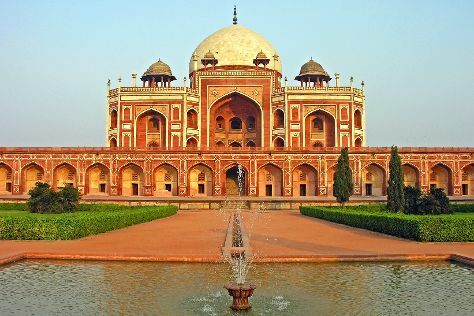 And it doesn't end there: admire the natural beauty at Humayun's Tomb, take in the spiritual surroundings of Lotus Temple, steep yourself in history at Gurudwara Bangla Sahib, and explore the historical opulence of Red Fort (Lal Quila). For where to stay, traveler tips, photos, and more tourist information, refer to the New Delhi trip planner . In June, daily temperatures in New Delhi can reach 45°C, while at night they dip to 32°C. Wrap up your sightseeing on the 8th (Sat) to allow time to travel back home.